Space is always a resource in cities. 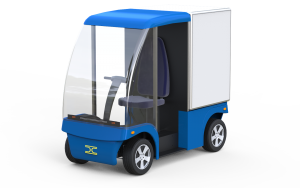 Therefore, KURT vehicles are designed to be compact, minimising the use of space and minimising the hindrance vehicles pose in a mixed environment of pedestrians and bicycles. Yet, the vehicle itself must remain functional, safe and convenient to use. 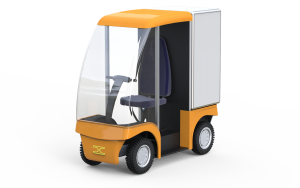 The modular and scalable KURT vehicle platform enables it. 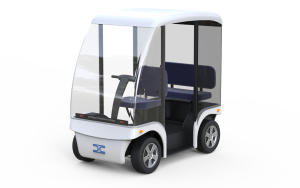 As the propulsion platform is standardised, it can be adapted to the needs, yet present a maximum flat space for the functional use of the vehicle. 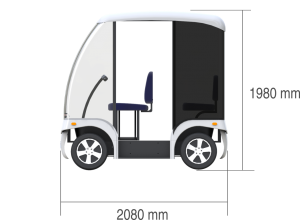 As a result, the smallest vehicle measures just 80 cm wide, not more than a bicycle or scooter. Yet it can handle one driver and 100 kg of cargo. 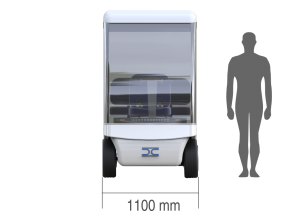 The larger City-KURTs measure 110 cm wide and can handle three people (one driver with two passengers) or one driver and 200 kg of cargo. Passengers and cargo are protected from the weather elements and from small collisions. The low center of gravity contributes to stability and safety.